In the book "Principles Of Marketing" Philip Kotler et al devised a very interesting concept of benefit building for products. Kotler suggested that if you view a product on three levels it will help you extract all the benefits that your product offers. This strategy has various names including Total Product Concept, Augmented Product and Three Levels Of a Product. Level one is the most basic level and simply looks at what people set out to buy and what benefits the producer would like their product to offer buyers. For example a camera is expected to take pictures but there may be other benefits that the producer wants the buyer to enjoy such as a wide lens, face recognition and high definition videos. So prior to designing any product designers should list the core benefits the product needs to provide. 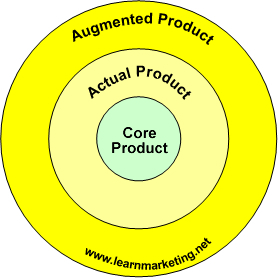 Level two is about translating the list of core product benefits into a product that people will buy. There may be competitor products offering the same benefits so the aim at this stage is to design a product that will persuade people to purchase your product. Kotler states that this can involve deciding on the quality level, product and service features, styling, branding and packaging. For example Apple's iPhone design has enabled it to become a smart phone market leader so that by September 2012 it was able to launch the iPhone 5, the 5th version of this product. There are other smart phones on the market but Apple has managed to design a product which people pre-order and camp overnight outside Apple's retail stores so that they can be the first ones to buy the product. Level three involves deciding the additional non tangible benefits that a product can offer. Competition at this level is based around after sales service, help lines, warranties, free/cheap delivery and so on. In other words it is things that the product does not do but customers may find them useful. Non tangible benefits such as product warranties offer customers peace of mind and demonstrate the manufacturer has faith in the quality of its product. In fact the ubiquitous use of some augmented benefits have turn some level three benefits into a customer expectation for example customers expect cars to have manufacturer warranties.